If you knew Joe Jones, as many of you do, you will quickly realize what a devoted artist he is and that creating aviation art is truly what he was born to do. 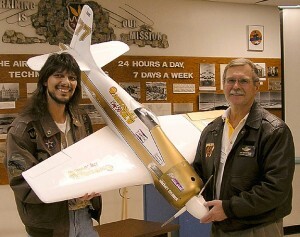 As his mentor, world renown aviation illustrator James Dietz, said as he shook Joe's hand for a photo during a visit to Dietz' studio in Seattle, "Joe, I'm passing you the torch," Jones did not fully realize at the time the huge commitment and responsibility that went along with the honor. He does now... he has gratefully excepted the challenge and responsibility! 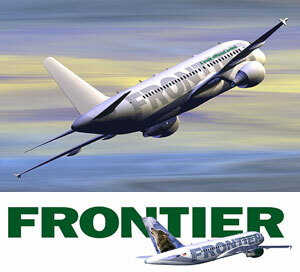 Aviation illustration is not just making pretty pictures of aircraft. It's about painstaking research and attention to the smallest detail in the hope of telling each story honestly, accurately and with full respect and integrity. It's about bringing each story to life as if you were right there yourself to fully help share and preserving our rich aviation heritage. 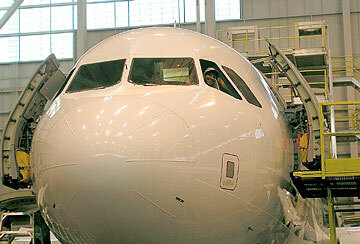 To do that it takes much more than just a passion for airplanes and technical skills. An artist must truly live and breath aviation every single day. Jones realized early on, to truly do this type of work with any sense of justice and dignity, one must become an aviator themselves to come close to having the ability and experience to visually capture the history, adventure, freedom, joy, discipline and achievement associated with flight. For Jones, it has quickly become the richest life one could ever imagine. A Denver native, pilot, and proud member of EAA chapter 43, Joe Jones has been both a professional illustrator and graphic artist since 1983. In 1995, he started his own successful design firm, Art Works Studio. Currently featured in the Macworld Illustrator CS2 Bible, over the last decade much of Joe's work has been showcased in nearly two dozen top books on Adobe Photoshop and Adobe Illustrator as textbook examples of some of the best digital artistry in the business. Since 2001, Joe's trail blazing digital aviation design and illustration work have landed him accounts with clients such as Adobe Systems, Rolls Royce, Frontier, and Indiana based Chautauqua Airlines. Jones has also gone on to create national ad campaigns for Adidas and has also worked with performers such as Carlos Santana. Over the last several years, Jones has quickly been recognized and awarded as one of the worlds top artists in the air show industry today creating the annual campaign work for clients such as Rolls-Royce and the National Aviation Heritage Invitational. Recently breaking all "ICAS" (International Council of Air Shows) records in consecutively receiving the industry's top honors for his 2004 and 2005 campaigns for Nellis Air Force Base and Aviation Nation. 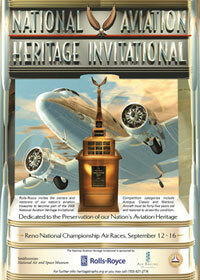 Jones is the only aviation artist in the world to receive five first place ICAS awards. Committed to helping preserve our aviation heritage and dedicated to honoring our American veterans, Joe spends a considerable amount of his time each year volunteering his skills to the EAA, several air museums throughout the country and works closely with the 8th Air Force Historical Society and the Tuskegee Airmen Inc. Jones also works directly with The Greatest Generations Foundation, and Shades Of Blue, producing award winning graphic design and illustration work to help promote these important groups. 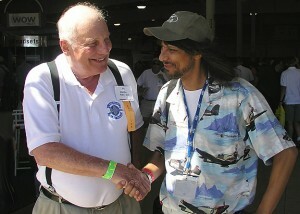 Please contact Joe at Joe@Airmail-Greetings.com or use the form on our Contact page. Jones says quite often, "If you see any spark of life at all in my work, it comes directly from the inspiration and support of all of the incredible aviators I have had the great fortune to spend time with over the years." Below are just a few of special people that have influenced Joe and his work. 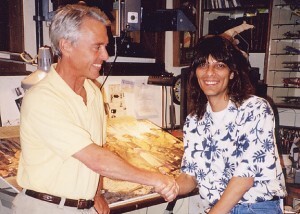 This photo was taken seconds after world renown aviation illustrator, and mentor to Jones, James Dietz, passes the torch to Jones as his studio in Seattle WA. THANK YOU JAMES! 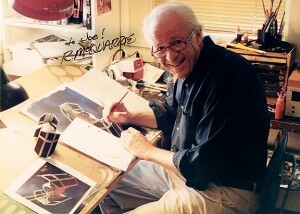 Mentor of Jones, visionary and original conceptual illustrator for Star Wars, Ralph McQuarrie. It is not widely know that Ralph, a Korean War veteran, and the man that brought us Darth Vader, C-3PO and R2-D2 got his start as a technical illustrator at the Boeing Aircraft Co. in Seattle. 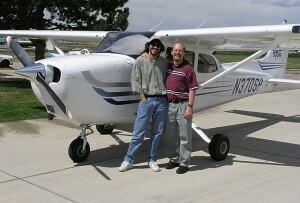 Personal hero, and Jones' flight instructor, Master CFI, and President of Specialty Flight Training Inc. Lonnie Hilkemeier, stops for a photo after putting Jones through his paces. THANK YOU LONNIE! This photo was taken thirty four years to the day this living legend walked on the moon, Apollo 11 Commander, and personal friend, Neil Armstrong, spends time with Jones for the first time. The last man on the moon, Apollo 17 Commander, Gene Cernan greets Jones. Apollo 8 Commander, Frank Borman, shares stories with Jones. America's only triple ace, and friend Brig. 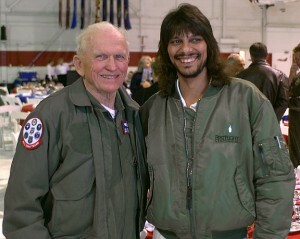 General, Robin Olds share stories with Jones. 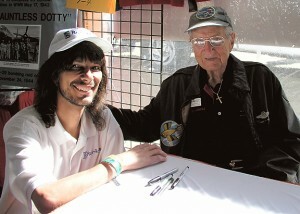 Assigned to crew #12, original Doolitle Raider and personal friend, Bill Bower shares stories with Jones. 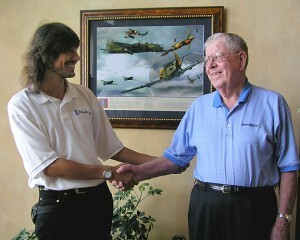 Legendary Commander of the B-17, Memphis Belle, Col. Robert Morgan shares stories with Jones. 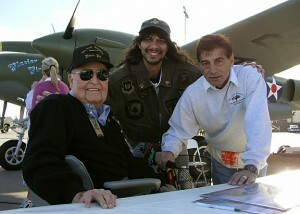 Personal friends and the men responsible for the recovery and restoration of the P-38, "Glacier Girl", Roy Shoffner and Bob Cardin visit with Jones. 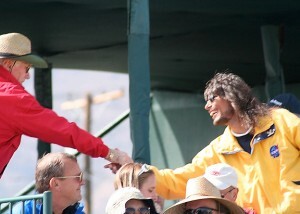 Jones had the great treat to become brakeman three times in Glacier Girl in one weekend. 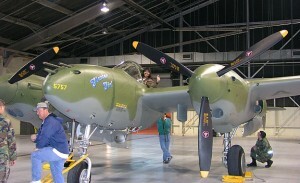 You can count that he was grinning ear to ear as he make airplane noises in the cockpit as it was being towed. 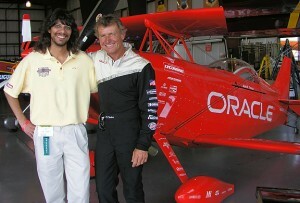 Top national aerobatic air show pilot and personal friend. Sean Tucker visits with Jones. 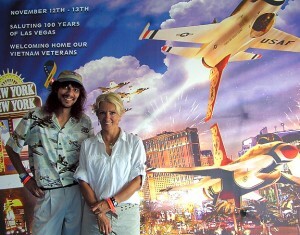 With Jones' event artwork as a perfect backdrop, top national aerobatic air show pilot, Patty Wagstaff visits with Jones. 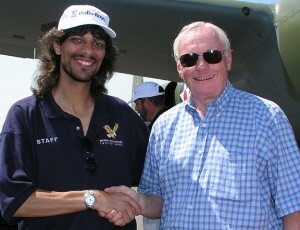 World record breaking Reno air race pilot and friend, John Penney spends time with Jones. 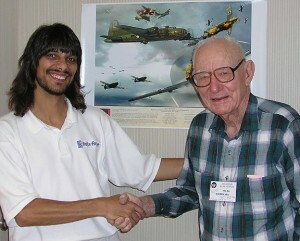 Jones met Ruben Neie, commander of the B-17, Kipling's Error III, for the first time after working together for months. Taken soon after the compleation of the commissioned illustration of his 96th BG B-17, shown behind, which depicts a specific air mission flown by Neie, and his crew on July 28th, 1943 high over the West Coast in Oschersleben, Germany. 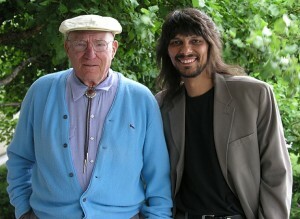 Jones met Lloyd Mitchell, decendent of Billy Mitchell, and navigator of the B-17, Kipling's Error III, for the first time after working together for over six months. This photo was taken right after the compleation of the commissioned illustration of his 96th BG B-17, shown behind, which depicts one specific air mission flown by Mitchell, and his crew on July 28th, 1943 high over the West Coast in Oschersleben, Germany. One of Jones' dearest friends, Lt. Col. James Harvey, original Tuskegee Airmen. 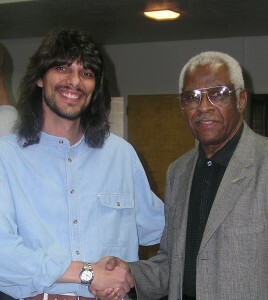 James is distinguished as being this country's very first Black jet fighter pilot, flying missions over Korea, and was also awarded in 1949 as the USAF first "Top Gun" pilot. Tom Cruise, wishes he could be Harvey!